Ellen Gilson Voth: Bio & Choral Music | Santa Barbara Music Publishing, Inc.
Ellen Gilson Voth (b. 1972) enjoys an active and diverse musical career as a conductor and educator, composer and pianist/organist. 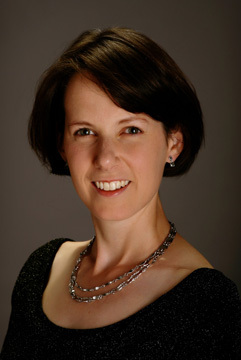 Currently she is Director of Choral Activities and Music Coordinator at Western New England College in Springfield, MA. She has served on the music faculty of Gordon College in Wenham, MA and at Ithaca College in Ithaca, NY, and as choral director at Perkiomen Valley High School in Collegeville, PA. Voth has also served on the faculty of the Masterworks Festival in Winona Lake, IN and the Csehy Summer School of Music in Langhorne, PA. Her conducting with community choirs includes her current work as Director of the Farmington Valley Chorale based in Simsbury, CT. She has also served as Chorus Director of the Pioneer Valley Symphony Chorus (MA), as Director of the Symphonic Chorale at Gordon College (MA), as Assistant Conductor of the New Haven Chorale (CT), and as conductor of the Cambiata choir with the Connecticut Children’s Chorus. She has been active as a guest conductor for choral festivals and as an adjudicator in the region, and has served on the executive board of CT-ACDA. As a composer, several of Voth’s works are published by Oxford University Press, ECS Publishing and Colla Voce. In past years she has been commissioned by the Central Bucks West High School in Doylestown, PA , by the New Haven Chorale in New Haven, CT, by the Children’s Aid Society Chorus in NYC, and the Greater Middletown Chorale in Middletown, CT. Recent honors include being the winner of the Twin Cities (MN) Women’s Choir composition competition and a semi-finalist in the call for scores from the Choral Arts Ensemble of Rochester, MN. She also remains active as a performing pianist and organist. Voth received her doctoral degree (DMA) from The Hartt School, Univ. of Hartford (CT), her master’s degree (MM) from Westminster Choir College of Rider University (NJ), and her bachelor’s degree (BME) from Wheaton College Conservatory of Music (IL). Ellen Gilson Voth has 1 titles published with Santa Barbara.